Since the closing of the Well's day-time drop in center on Florida Avenue, a location into which we have poured our lives and resources over the last two and a half years, I have been thinking a lot about a certain ritual of Tibetan Buddhism. 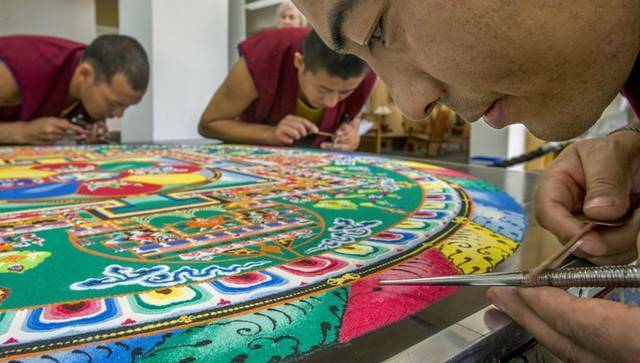 Monks will work in a small team over a period of time, usually a week or two, as they meticulously construct a profoundly symbolic and intricate design. Using tools called chak-pur, little metal straws and funnels, they apply colored sand to create the sacred mandala. If you have ever seen this process you know how powerful and beautiful it is to such painstaking focus and dedication to the creation of beauty. It really seems like a profound act of worship. 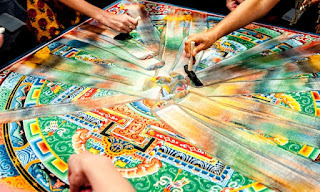 After the construction of the mandala there is a ritual deconstruction of it. This ceremonial act symbolizes the ephemerality and impermanence of life and the world itself. It is such a powerful thing to witness this masterpiece of art and discipline being swept into a jar that will be taken to, and dumped into, a local river or stream. It is this deconstruction piece of the ritual in particular that has been echoing in my mind over the course of the last several weeks as a team of people who have poured blood, sweat, and tears into this place, slowly but steadily deconstruct every last thing here. We build a chicken coop and now we have taken it down. A deck, dismantled. Gardens removed. An aquaponics system, drained and being packed up. Family Room, emptied. One thing after the next is another moment to reflect on the discipline and work that went into it, appreciate it for what it is, and then remove it in our best attempt at non-attachment. Like the monks who construct beauty over the course of a few weeks, this team has constructed something beautiful over the course of several years. Much of what we have built remains however because it was built in out hearts and minds, in our relationships and our community, it is a kingdom that is not of this world, and yet what is tangible in this world is this very impermanence. I have been so proud of our team as they show up every day and work tirelessly to deconstruct what has been the central project of their lives. They know that these coops and gardens and decks are but outward signs and symbols of something undeconstructable that is calling us forward. While many can see holiness in the monks performing rituals, I cannot help but see that same holiness in this team that I am so grateful to be a part of. I am awed by the wisdom and strength of those who can smash the work of their own hands with a smile on their faces. It is this commitment to something that transcends these mere incarnations, manifestations, or symbols that demands my attention. The very things that might tempt some to make idols of them, or at the very least produce overwhelming attachment, are let go of in an act of trust and surrender. So we wipe the sands from the table of 3023 away. With peace and love and hope we can let go of the forms that our work takes because it is the call itself, from which the work emerges, that holds us in its grip. There are many tables and there is always more sand, maybe you will join us at a table in the future as we begin our next mandala. Below is a short video from a kids show if you would like to watch this deconstruction of a mandala that I am referring to.